A native of the Americas, mahogany is a rich hardwood with an excellent grain. Mahogany doors have been around since the mid 18th century, when this valued wood was discovered to have straight grain and is relatively free of pockets. 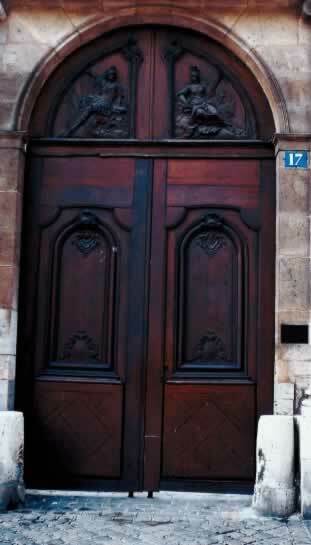 Exceptionally durable, mahogany doors resist splitting and wood rot, making them an excellent value among the hardwoods. Early American craftsmen have long appreciated the resilience in mahogany carvings, using the wood for fine furniture in addition to entry and interior doors. The dark stains and panels of this door have a red luster when set against the light colors of the framework and tiled path. Florets, figurines, and raised panels make this a brilliant example of the colonial period with a heritage reaching back to its European traditions.